Janis Hutchinson, Out of the Cults and into the Church (Grand Rapids: Kregel Publications, 1994) 222 pages, ISBN 0-825428-85-8. Imagine growing up in a culture where virtually all your family, friends, neighbors, school teachers, policemen and everyone you love and trust adheres to a certain religious faith that claims to be the “one true church.” Then one day you start to entertain the possibility that what you had been taught all your life may not really be the truth. Gut-wrenching? Overwhelming? Anguishing? Bewildering? These are just some of the words used to describe the feelings of people who have actually lived through the above imagined scenario. Janis Hutchinson was a member of the Church of Jesus Christ of Latter-day Saints (LDS Church) for 34 years. During those years she held many LDS Church positions. She also wrote articles published in the LDS Church’s Marriage Manual and The Improvement Era (now entitled, The Ensign), excerpts of which were used in LDS radio commercials. After over three decades of LDS Church membership, she concluded it is not the one true church it claims to be. Unfortunately, she then sequentially joined two radical religious groups. First, the Bryanites (Church of Christ, Patriarchal), and then Mormon Fundamentalism (radical offshoot group of the LDS Church). It took her almost eight years to recover to the point where she felt somewhat normal again. Hutchinson knows what it is like to face her fears of leaving the familiar in search of finding spiritual truth, and allowing herself to begin questioning the religious beliefs she held for over three decades. Her life experiences, Bible knowledge, and spiritual maturity have helped her become a godly lady who is compassionate and understanding towards those who are struggling with similar circumstances. Over several years, she has displayed wisdom with helping people make discerning spiritual decisions. Out of the Cults and into the Church by Janis Hutchinson paints a clear picture of the tumultuous and painful rollercoaster ride experienced by many people who leave a religious group that claims to be the one true faith. The problems presented in this book are the more severe ones experienced by many ex-members of such groups. This book refers to only three of the many that make this claim: the LDS Church (Mormon), Unification Church (Rev. Moon), and Hare Krishna. 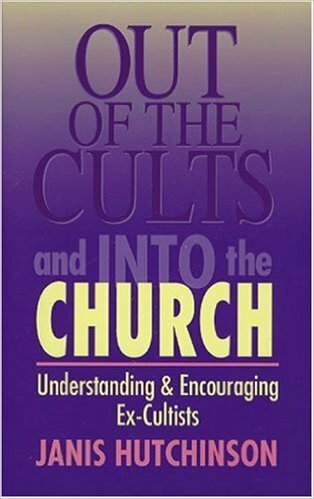 Hutchinson states that her reason for using the word “cult” is because it is the word used by “Christians at large” when referring to a “religious group which deviates doctrinally from the traditional norm” (p. 13). The book has a two-fold purpose. It seeks to help mature Christians understand the spiritual and psychological problems these ex-members can experience after becoming new Christians, so they can minister to them with spiritual sensitivity and compassion. All ten chapters end with a section entitled, “How Can Christians Help.” The book also seeks to encourage these ex-members by first giving them a heads-up on what kinds of problems they may experience during their transition into the Christian church and then some advice on how to best navigate through those problems. After leaving Mormonism, Hutchinson struggled with giving up Mormon doctrines she had believed in for years. She also struggled with Christians who didn’t understand the years-long transition she was experiencing. She went on to increase her Bible knowledge by earning a B.Th and M.A. degree in theology. Out of the Cults and into the Church is the culmination of Hutchinson’s master’s thesis, as well as a product of the many lessons she learned first-hand during her years of struggling to replace her formerly held Mormon worldview with a biblical one. Her writing reflects one who is mature in her Christian faith, and knowledgeable of Mormonism. In the book, Hutchinson creates five interesting characters whose life experiences illustrate the various problems encountered by many people leaving churches that claim to be the one true church. Three of the five characters are ex-Mormon (Judy, Melanie, and Myra), one is an ex-Hare Krishna (Richard), and one is an ex-Moonie (Elizabeth). The author included more ex-Mormon characters simply because as a former Mormon herself she has more experience counseling them. However, her research shows that problems experienced by ex-Mormons are typical of other such groups (p. 13). Throughout the book, the author also frequently cites secular researchers who are knowledgeable about the mental conditions of members from similar religious groups. The content of the book essentially consists of the author detailing numerous friendly, compassionate, and culturally sensitive talks between her and one or more of the five characters. Most of the dialogues consist of impromptu talks between the author and a character who is struggling with a particular religious issue, but also included are numerous talks involving all the characters in a formally structured support group setting. All the dialogues begin by identifying some problem(s) experienced by the character(s), and then proceed toward helping them better understand and biblically resolve the problem(s). In one formally structured support group setting, the characters agreed that when people leave a church that claims to be the one and only true church, they must also eventually give up many cherished practices and beliefs. In chapter three, the group listed the following 13 practices and beliefs, and then discussed some Christian substitutes for them. The author’s introduction to the various talks sets a stage that makes you feel like you are sitting right there with them. Here’s how Hutchinson describes one of the settings: “We sat at a round, glass-topped table shaded by a lavender umbrella on the patio outside my Texas home. Lush foliage and beds of yellow and pink roses offered a serene setting. It was just what she needed.” (p. 17-18). A reader could conceivable close their eyes and get a picture of the various physical settings in which the talks occur. More important than physical setting is the practical life-changing advice Hutchinson gives her reader. Her compassion, sensitivity, Bible knowledge, and life experiences enabled her to successfully write a book that helps Christians understand ex-members of such religious groups and encourages these ex-members in their transition into the Christian church. As an ethical, caring person who is willing to listen to the concerns of Mormons in transition and share with them struggles she had from her own life experiences and faith, Janis Hutchinson has volunteered her time to serve as a Former Mormon Mentor with the Institute for Religious Research. You can be mentored by someone like Janis by signing up for our Mentoring Program. In addition to Out of the Cults and into the Church, Hutchinson has authored one other book entitled, The Mormon Missionaries: an inside look at their real message and methods.